FireKeepers Casino Hotel offers gift card purchases through Trader’s Blanket Gift Shop and The Pit Stop. 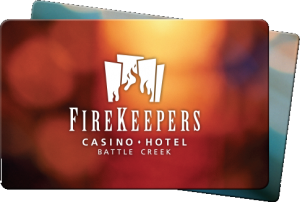 Give one as a gift and let someone enjoy the fun and vibrancy of a trip to FireKeepers, from the casino to one of our fabulous restaurants or our Four Diamond Hotel. You can check a balance at any cash register throughout the property. Gift cards cannot be used for gaming, gratuity or for purchases at the Box Office.